Mahindra Group has acquired BabyOye.com, for an undisclosed sum. 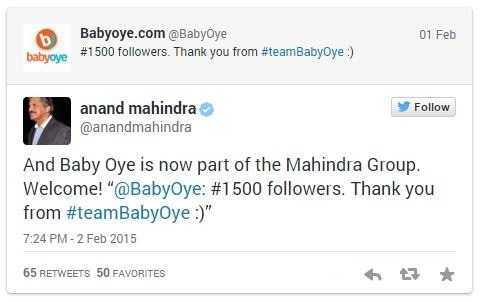 Anand Mahindra, Chairman and Managing Director of Mahindra Group announced the acquisition of BabyOye on Twitter with this tweet. Mahindra Internet Commerce is part of Mahindra Retail, which operates Mom & Me and Beanstalk, which are offline retail stores with a weak online presence. BabyOye was founded by husband-wife duo Sanjay Nadkarni and Arunima Singhdeo in 2010, and for the year ending March, 2014, they had reported revenues of Rs 29.8 crore compared to Rs 18 crore the year before. For the same period, their net loss increased to Rs 10.5 crore from Rs 15.1 crore a year before. In 2013, they had raised $12 million from existing partners Tiger Global, Accel Partners and Helion Venture Partners, after which they had acquired Hoopos.com. Before that they had raised venture funds in 2011, during which Karishma Kapoor had been roped in as an investor. The present status of this venture partnership is not clear. Mahindra’s Mom & Me and BabyOye are in the same vertical: they both provide baby and maternity products and their targeted audience are parents. Although Mom & Me was founded in 2009, and has over 100 outlets all over India, their digital presence is miniscule. In 2011, they launched an ecommerce portal: Momandmeshop.in which has failed to get traction. After the acquisition of BabyOye, they can look forward to increased online sales and more importantly, branding. FirstCry.com, the leader in this space, is not only BabyOye’s, but also offline retail Mom & Me’s biggest competitor. They have increased total offline retail presence to over 100 outlets, with the aid of franchisees. Already, they have received $60 million venture funding, which is almost 4 times that of BabyOye, and their operations are ramping up pretty fast. In such a scenario, Mahindra has cleverly teamed up with BabyOye to counter FirstCry both on the online as well as offline space. Additionally, Flipkart and Amazon are already getting stronger with baby care products, and the competition from these ecommerce portals can’t be ruled out. As per a research done by RNCOS E-Services Pvt. Ltd in April 2013, Baby and Children’s product market is worth $11.8 billion, which is growing at a rate of 17% per year. By 2017, the market would be worth $26.2 billion, and Mahindra wants to dominate it. They understand that the way Internet, eCommerce and Retail is melting inside a typical Indian consumer psyche, it is very important to have a solid online presence, along with offline retail for all round growth. This is the first major acquisition of an ecommerce company by an established retail chain, and industry insiders are predicting that this deal can set precedence for much more offline-online mergers in future. Micromax Increases Lead Against Samsung In India. 1B Android Phones Shipped Globally. Maharashtra Citizen’s Data Will Be Stored On Microsoft Azure Cloud. Security Concerns? Microsoft Acquires Linkedin in USD 26.2 Billion All-Cash Deal! Jugnoo Acquires Hyperlocal Delivery Startup SabKuchFresh! Microsoft Buys Swiftkey, a Popular Keyboard App for $250 Million!